We wanted to find a school where our children could be both academically challenged and simultaneously encouraged to be creative. The Peck School met this dual requirement better than we could have ever imagined. “We wanted to find a school where our children could be both academically challenged and simultaneously encouraged to be creative. The Peck School met this dual requirement better than we could have ever imagined,” explained Zheng Song-Decker and Nick Decker. After they settled in to their new home, the Deckers found out that their neighbors Steve and Barbara Boyd had two Peck graduates at home. During neighborhood walks, the Boyds could not be more complimentary of Peck. Their goal was set—they wanted their children to attend The Peck School. The Deckers spent the next four years living in Beijing. In 2012, they began the process of returning and were thrilled to learn that Peck had spots for both of their daughters for the fall of that year. They resettled in a new home in Mendham. Since their return, the Deckers share three success stories. “Our wonderful niece also joined Peck in 2013 and went on to attend Phillips Andover Academy. Our older daughter Nicolette graduated from Peck and went on to attend Choate Rosemary Hall, and our younger daughter Adia is thriving in Peck’s seventh grade. Our children love the community, teachers and the learning experience at Peck,” said Nick Decker. We always tell our children that others can take almost anything away from you—but they can never take what is put into your mind. Therefore, there is nothing more important than a great education and ongoing learning. The Deckers are grateful for the many generations of Peck families that have supported Peck’s progress, whose dedication and contribution to past campaigns is truly inspiring. 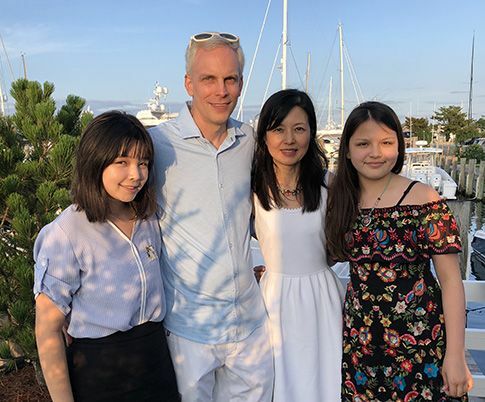 With their children’s experience at Peck and their love for the Peck community, past, present, and future, the Deckers made a commitment to The Peck Promise Campaign after hearing its story from Head of School Andy Delinsky. “We always tell our children that others can take almost anything away from you—but they can never take what is put into your mind. Therefore, there is nothing more important than a great education and ongoing learning,” said the Deckers. While their younger daughter may only get to spend one year enjoying the vibrant energy of the new Peck Commons, the new STEAM wing, and other improvements from the campaign, they share the sentiment of so many Peck families that it is their role and privilege to “pay it forward” in homage to those who did so before them.